Well, this seemed like fun after going through another 9/11 anniversary. 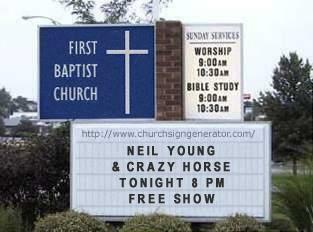 More like a really good dream -- Neil & the Horse in a little roadside church -- and a free concert, too! A bunch of Neil sign pictures from the road over the years. Some are kinda funny. Others, just innnaresting. More Neil Young Sign Photos on Thrasher's Wheat Photo of the Moment Page. Whoa - Neil gets religion?! That would be right up there with those OPL shows. Always wnated to see Neil & The horse in a little place. Reminds me of the concert review from many years ago: Crosby, Stills, Nash and God.